Sister Chân Thuần Khánh was ordained as a novice nun on February 5th 2000 at Từ Ân Temple in Hue, Vietnam. 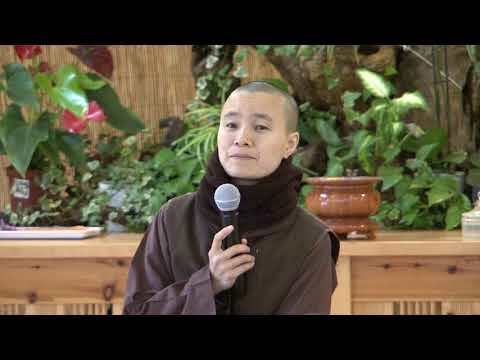 She received full ordination as a bhikshuni on January 9th 2004 in Deer Park Monastery. She received the Lamp Transmission from Thầy to become Dharma Teacher in 2007. When she was 15 years old, she had a dream to be in a place where there is a lot of beauty. Then, when she was 17 years old, after having been ordained for two years as a novice, her cousins Br. Pháp Đăng and Sr. Tuệ Nghiêm, who had already ordained under Thầy, asked her whether she would like to come to Plum Village. She really wanted to discover a beautiful path and it watered the seeds in her to come to Plum Village. She had the aspiration to become a Buddha in one year with the the concrete practices and Dharma doors of Plum Village. Then she would be able to go back to Vietnam and help her younger Dharma sisters at her temple, but she decided to stay at Plum Village until now. A sister at Plum Village said to her and Brother Trung Hải, who is both her Dharma brother and her blood brother, “You are just like a fish coming back to the ocean, to your home. You look so free and joyful.” She helped her to recognize how happy, free, and comfortable she was. It has sometimes been an obstacle for monks and nuns who come from other traditions and decide to live in Plum Village that they feel not included in the sangha, or not loved by Thầy and the sangha. When she was attending Thầy at Deer Park Monastery, Thầy said to her, “Sister Thuần Khánh, do you know why you had been ordained for a while and then you had a chance to meet me? May be in the past life, you skipped walking meditation with the sangha!” Then, Thầy and she laughed together. Another time, Thầy said to her, “Do you know that I love you and feel more comfortable with you more than any other disciples that I have ordained myself?” It helps her to practice Thầy’s guidance, “Whoever you are, wherever you have come from, you are all my disciples.” She has a lot of interests in the Manifestation-Only teachings and her favorite practices are walking meditation and touching the earth.